If asked, my character would prefer option 2, no doubt. That said, she is a long lived race and has traveled far to get there. She doesn't expect anything to happen overnight, and may even expect to have to work her way into his good graces. If that means helping secure the Ghol Varad region, she wouldn't argue. As a potential player, I'm good with either option. And that is ambitious, running two story lines and dealing with that many players! I won't hold you to the daily post rate, but if you mange it, I'll do my best to keep up. Last edited by Still_Pond; 04-10-2019 at 11:50 PM. Spent the last little bit reading through everyone's background and tried to determine who would or wouldn't work with a character hook to have prior knowledge of each other before the game started. A lot of people were from different sides of the world, which wouldn't have fit, but I did manage to find a few. - I really like the concept of Hundur's character, Krumir, but as much as I want to come up with a hook, I can't hope to justify it. Out of the 5 ideas I came up with, I found one that might work. - Another character I saw that might work would be Squirrel's Korbyn. The idea I have with this one would probably cause some tension later on in the game, but could work out. - I believe I'd be able to also figure out a hook with Odyssey's Travish character. This idea at least is on the lighter side of things. - I was looking for a specific character that I might be able to get a hook with for a while down the road. It might not even come up but it's possible that DaysUntold's Amaiya might fit. If any of you are interested in the ideas I have, feel free to let me know or send me a PM and I'll pitch my ideas. My character's backstory is intentionally vague for the last bit of time she's spent on her travels. It would be pretty easy to work her into pretty much any backstory that also involves traveling to Ghol Varad, especially in the final few weeks or months of her journey. Hmm, I think Zion fits better in option #1. As you probably deducted from my application, Sir Devon Stonefort would fit option #2 better. As of right now, Trav would follow those he's connected to, so I'm going to go with Option 3, I think. Not to say he doesn't have ambitions of his own but he'll grow into it. Kymrel was interested in a character connection, as well as DaysUntold and Hundur. Kymrel's character makes the most sense so far for as a connection, but if anyone else thinks of a good connection idea, you can PM me and we can work it out! Last edited by Odyssey; 04-11-2019 at 08:39 PM. I'd say ahhni is in group 1 simply because while he wants to find what hes looking for a kenku would lack the drive for expansion and hed wind up following the first recruitment for the "easier" life. You know, I'm going to switch to option 3 for my gnome wizard character, perhaps still leaning toward option 2. This is because I had a thought. My character's goal is to learn and study, so she may like to have a home base in which to do this. I imagine artifacts or stories might find their way back to Ghol Varad for her to study. There may even be opportunities for her to request expeditions into more remote places that specifically target things she suspects are out there. So either option will work really well for her - put her where she's most useful. Last edited by Still_Pond; 04-11-2019 at 06:22 PM. Just wanted to say this looks like an amazing and fun game. The posting rate is the only thing keeping me from applying as RL doesn't allow for a daily post, but hope you all have fun. Again, great concept! Planning to post my concept this evening - hope it is not too late for consideration, as it looks to be an exciting hook for a game. Go for it - I’ve already started making selections, but a great application at the last minute is still a great application. There’s still time to get in. I'm open to character integration as well, though, due to her situation, she probably would have met people on her way after escaping the city. She would have been on the run, and fairly inexperienced at that. @sejik, she could have traveled with your character for a while. I was toying with giving her a one level dip into cleric anyways. Message me if this is something you're still considering. @memorybeast Option 3. She could easily swing either way, though perhaps leaning a bit more towards the second option. She cares very much for the plight of the people around her, but she's also VERY fascinated with magic, mysteries, and puzzles. I'll leave it to you, if I'm picked, to decide where I would fit best in your narrative. On the one hand, option 2 has an obvious appeal to a druid, but option 1 also fits with her motivations to keep an eye on the people returning to Karredral. Option 3 brings Wick’s inner conflict into stark relief. On the one hand, he feels a drive to help others and combat the forces of darkness. On the other hand (though he feels rather selfish about it), he came to this part of the world to find out more about his new hand and wrestle with his sense of destiny. Complete application below. Appreciate your late consideration, and do please let me know if there are any modifications I can make to bring the character more in line with your vision for the campaign. The application does contain some information I’ve chosen to make visible to the DM only, representing what I hope is an interesting hook for further development of the setting. Again, let me know if you’d prefer a different direction or feel it violates the spirit of your character creation guidelines. Appearance: Typical to many half-elves, Shaendal's looks generally favor her elven half. She possesses the slender features and pale green eyes of her father, while her complexion and flaxen hair come from her human mother. - I've always wanted to visit a ruin in Karredral. - I love Dwarvish cooking - and I don't let any elves know that! - I have too many books and no time to read them. - Justice often needs a helping hand. - Those who exploit the weak must be crushed. - I have fondness for both the world of the elves and that of the Karredrim, and I yearn for their reconciliation. - Reclaiming lost lands and building a future for our people is an adventure I want to be a part of. - My (human) mother's singing is the sweetest sound in the world. - My profession mixes uneasily with my ideals. I recognize that I am often used as a tool to sustain existing power structures. - Despite my stoic facade, my (elvish) father's disregard pains me to this day. - I spend so much time playing a role, I find that I rarely know myself. 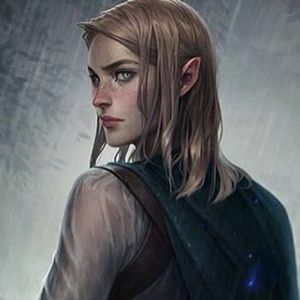 Brief Backstory: Shaendal's history - at least as much as she is willing to share - begins with an illicit liaison between her human mother and an elvish noble lord. As far as she is concerns, it ends there, too. Her mother has served drinks for years at an inn you're sure you've never heard of, and her father...she'd rather not. No use digging at old wounds and telling sad stories about fatherly neglect and elvish bigotry. Shaendal has a life of her own to live, and she's made her own way among the many Karredrim exiles living within elven demesnes. Since her teens, she has worked in the highly lucrative Karredrim underworld, running messages, smuggling goods, and cracking the occasional safe in service to the various gangs and mercantile concerns that inevitably spring up within disenfranchised communities. Denied the establishment of clear social hierarchies within the larger Elven society, humans sought other ways to establish just who mattered and who didn't - chief among them, the accumulation of wealth and power. When "respectable" Karredrim needed to obtain items otherwise denied to them because of their status in elven society, Shaendal had the contacts within the elven community, and occasionally the direct means, to get them what they desired. Varad's crusade into Karredral elicited no small excitement within the exile underworld. Imposing order upon the disordered realm would carry with it new, valuable opportunities to build trade, and thus to warp that trade to their own ends. Varad's success would benefit all Karredrim, but Shaendal's sponsors sought to ensure that it benefited them most of all. Shaendal herself has been captured by the excitement of the expedition, of the expansion into the unknown. She's been asked to join Varad's forces to build relationships between the exiles left behind and those building a new life in Karredral. But it is her own drive to explore the human side of her heritage that sustains her, and she is willing to do what she must to guarantee the reclamation of Karredral is a success. In furtherance of Shaendal's initial task as part of Varad's efforts, Group 1 is probably an ideal option - get familiar with the environs of Ghol Varad, discover who the local power-brokers are, ensure the town is a stable base of operations for future expansion, etc. Last edited by infidel; 04-11-2019 at 10:58 PM.